Write a program to check if two given String s1 and s2 are rotations of another. For example if s1 = "IndiaUSAEngland" and s2= "USAEnglandIndia" then your program should return true but if s2="IndiaEnglandUSA" then it should return false. For the purpose of this program, you can assume that Strings are rotated on the right side, but you should ask this question to your interviewer before jumping into the solution. Paying attention to such details score brownie points on real Interview. Remember, attention to details is one of the desired quality for software engineers. Btw, before concatenating String, you should also first check the length of the two String. If they are of different length than two strings are definitely not the rotation of each other, but if they have the same length then you need to check further. This will result in faster solution because checking length is faster than checking if a substring exists in the given String. You can see that when a user enters "IndiaVsAustralia" and "AustraliaVsIndia" then our program return false because they are not a rotation of each other, but, when the user enters "IndiaVsEngland" and "EnglandIndiaVs" then our program returns true because here two strings are the rotation of each other. That's all about how to check if one String is a rotation of another in Java. 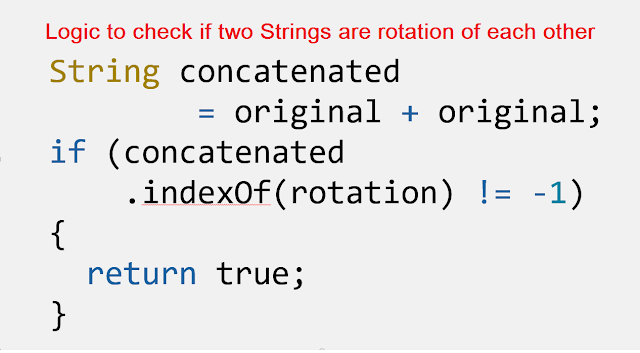 As I said, the simplest way to solve this problem is to concatenate String with itself and check if rotation exists in the concatenated String or not. If it exists, it means they are a rotation of each other. If not, the first string is not a rotation of other. Though, there are a couple of variant of this program which many interviewers ask as follow-ups e.g. how do you solve the problem if strings are rotated on the left side, or can you check if two strings are the rotation of another without using String concatenation. You can try solving those versions by yourself, but if you want to look for a solution, you can check it here. Thanks for reading this article so far. If you like this interview question then please share with your friends and colleagues.